The film 'Electric dreams' was director Steve Barron's first full feature film. Barron had made a name for himself conceiving and directing music videos, such as the Human League's 'Don't you want me'. For his film, Barron enlisted Giorgio Moroder as director of music. He wrote most of the score. Barron wanted the end credits to roll to 'an emotional song'. 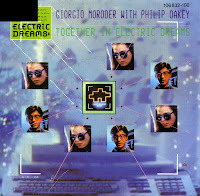 Moroder wrote 'Together in electric dreams' which was to be a male solo vocal. When he asked who Barron would like to sing the lyrics, Barron immediately thought of his former associate Philip Oakey. 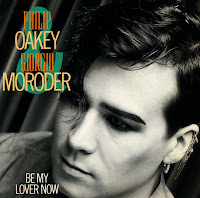 When Oakey recorded the song it was over very quickly, after the first full recording Moroder told Oakey that the first take was 'good enough, as first time is always best'. Oakey who thought he was just rehearsing insisted on doing another take. 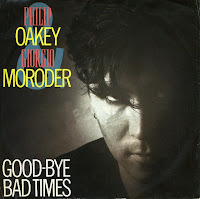 Moroder let him but to this day Oakey is convinced that Moroder still used the first take on the final production. The song soon overshadowed the success of the film. Oakey states that it is ironic that a track that took literally ten minutes to record would become a worldwide hit, while some of his Human League material that took over a year to record didn't. I've seen this single countless times over the years, but I never made the decision to buy it until now. Philip Oakey, frontman of the Human League, and producer Giorgio Moroder, had a big hit with 'Together in electric dreams' in 1984. They got together again in 1985 to work on an album that was to be called 'Body beat', but finally was simply named after the performers. The record label had high expectatoins for the first single from the album, 'Good-bye bad times', but they did not come true. Both the single and the album flopped. This is still a nice popsong though.